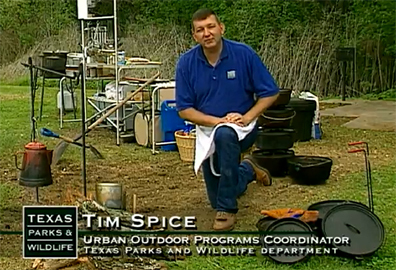 If you think the "official" cooking equipment of Texas is a barbecue, think again. The humble Dutch oven can produce some mighty fine victuals, and iron pot cooking is perfect for many an RV trip. But how do you go about cooking in a Dutch oven--and can you do more than the standard "pot o' beans"? The good folks from Texas State Parks would love to have everyone come on down and visit the Lone Star State. Since an army of RVers travels on its stomach, to sweeten the come-on, park officials have produced a series of three, free YouTube videos on the fine art of Dutch oven cooking. Part one is an introductory segment, giving a bit of history of the oven (and its relationship to Texas), but also provides good pointers on how to care for this "natural non-stick" piece of cooking equipment. Part two takes you right into the outdoor kitchen where you'll learn the secrets of making a fabulous (and easy to make) one-pot meals. Think beef stew, chicken stew, and of course the mandated "pot o' beans." Once you've got the basics down, it's time to bring out your inner Julia Childs. Part 3 features the fancy stuff you can do with your outdoor cooking iron: Quiche Lorraine (do real RVers eat quiche? ), Cornish game hens, and a desert my mouth waters for: peach cobbler. Grab your charcoal briquettes and point your browser to YouTube--it's time to get cooking--the Dutch oven way.